Images of Mohammed Emwazi, recently identified as the Islamic State executioner known by the moniker ‘Jihadi John,’ have been revealed, showing the boy in a school playground 11 years ago. The video, discovered by Channel 4 News, shows Emwazi taking part in a kick-around with other pupils at Quintin Kynaston Academy in St John’s Wood. Shot in 2004, the video shows one of the boy’s friends shouting “Emwazi” and beckoning him to join in the football game. Emwazi is seen to be a valuable player as he is picked second from the group of boys. 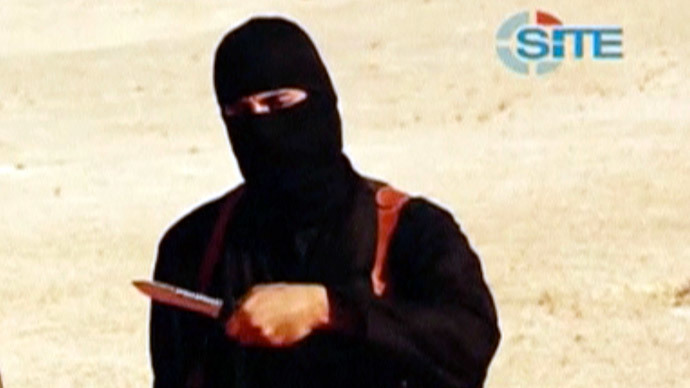 The video appears to show Emwazi as camera shy and reticent. The images are the latest revelation about Emwazi’s life before he traveled to Syria and became a poster-boy for the Islamic State. But other said he may have been bullied or unpopular during his schooldays. “He had some issues with being bullied which we dealt with. He didn’t have a huge group of friends,” she added. The video comes as the violent side of Emwazi’s past was uncovered by the Evening Standard. The newspaper reports that even prior to being detained by MI5 and questioned about suspected terror activities, Emwazi was responsible for the kidnapping of two boys in retaliation for a gang attack on his brother. Emwazi allegedly forced the teenagers into a car at gunpoint and ordered them to strip to their underwear before leaving them stranded on the M1 motorway. A friend of the terrorist, who wished to remain anonymous, told the newspaper it was to avenge an attack on his younger brother Omar, who had been beaten up and attacked with bricks the previous day. The incident took place while Emwazi was still a student at the University of Westminster and was sparked by the “postcode rivalry” of two West London estates. “I ended up going to Mohammed’s house to buy a bike off Omar. He sold stolen bikes to people at school and you would get a big discount,” the friend said. “I was planning an ‘in and out job’ but two guys saw me. There was a big fight. They threw a brick at my head and broke my arm, Omar was punched in the face a few times and beaten up. “The next day Mohammed turned up with two religious guys with beards. They drove round in a car and found these two guys who attacked us, threatened them with a gun, made them take all their clothes off and drove off. They dumped them on the M1 motorway. They weren’t attacked physically but they were threatened. It was a message. Given that the kidnapping took place prior to any interaction with security services, these revelations cast doubts over the claims of human rights charity CAGE, who say Emwazi was radicalized by government foreign policy.